The city of Atlanta is the center of commerce, entertainment, and tourism in the south. As such millions of people travel to the city of Atlanta as well as other cities in Georgia, staying in hotels, motels and resorts. Unfortunately the region has witnessed a massive explosion of bed bug infestations resulting in thousands of individuals suffering from severe bed bug bites. 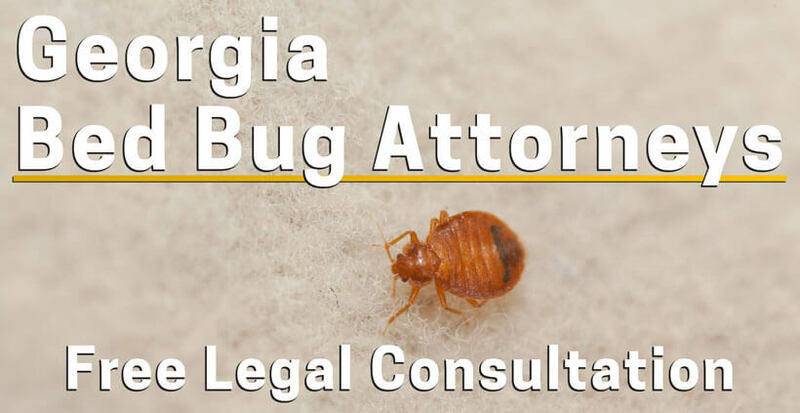 Our law firm and our associate attorneys are proud to represent individuals who have suffered harm due to bed bug infestations in Atlanta and across the state of Georgia. Below you will find important information regarding bed bug lawsuits and recovery for the damages you have suffered due to the negligent and wrongful conduct of hotel managers and property owners and landlords. If you have any further questions after reading this article feel free to contact our law offices. Our Georgia bed bug attorney will be happy to review your case. All legal consultations and case reviews are provided by our attorneys free of charge. Victims of bed bug bites should follow certain steps in order to protect their rights to compensation for the injuries and damages suffered. Below we will outline some of these steps. Take pictures of the bed bug bites and the bed bugs. In most instances rooms infested with bed bugs contain a hive or a swarm of bed bugs. Try your best to find them and take pictures and video footage if possible. File an incident report with the hotel: Contact the hotel security or managers and let them know about the incident and make sure they take down an incident report. Ask for a copy of the incident report or take a picture of the incident report they took down. Seek medical treatment for your injuries: Go to a local emergency room or urgent care center. If that is not possible seek medical assistance from your primary care doctor. Make sure they document your injuries and confirm that the bites were bed bug related. DO NOT speak with managers, staff, owners, or any insurance adjusters associated with the hotel regarding a settlement in return for a release. Any comments or offers you make towards a settlement can be used against you to reduce or deny your right to recovery. Of course, you can speak with the hotel staff and property owners about the bed bug incidents, but not about a possible settlement. You don’t know the extent of your injuries and you don’t know how much money you are entitled to. If you settle with the property managers on your own, you could end up getting a lot less than you deserve. Seek legal attention from an experienced personal injury attorney who has extensive experience with bed bug lawsuits in order to learn more about your legal right to recovery and the potential value of your bed bug claim. There are many places where a bed bug infestation and corresponding bed bug bite can take place. Some of the most common locations where bed bug infestations can take place include the following. Hotels, motels, resorts and hostels. Apartment complexes and Airbnb rentals. Office buildings and doctors offices. Uber and Lyft vehicles – also taxicabs busses and trains. Bed bugs in movie theater seats. Bed bugs in spas, nightclubs, bars, and restaurants. Bed bug infestations in schools, gyms, and fitness centers. Victims of bed bug infestations and bites have the right to seek financial recovery for all damages they have suffered. This includes the following. All medical care and treatment costs associated with bites. Many individuals will require extensive medical care due to the development of scarring from the bug bites. All future medical and health care costs. Loss of income and future loss of earning potential due to your injuries. Damage and or destruction of property – including infested clothing, furniture and other household items. Mental anguish and pain and suffering: Victims of bed bug bites often suffer from severe mental health complications including depression, insomnia, and anxiety. Punitive Damages: In the state of Georgia punitive damages can be awarded in cases where the at fault party acted in reckless indifference for the life and health of hotel room guests and or apartment building tenants. For example, if they had notice of the problem and they had multiple opportunities to cure but they did nothing, you could potentially get punitive damages. Statute of limitations refers to the timing period a victim has to file a civil lawsuit for monetary recovery in the court of law. In the state of Georgia victims of personal injury have two years from the date of the incident to file a civil lawsuit in the court of law. Failure to file a claim in a timely period will result in an elimination of your right to recovery. In some instances minors, individuals under the age of 18, may have until two years from the date of their 18th birthday to file a personal injury lawsuit in the court of law. If you have any questions about your time limit in Atlanta, you can contact our Atlanta bed bug attorney. If you have a case in other cities or states, please contact our law firm. If you have any further legal questions regarding a bed bug infestation and injury incident feel free to contact our law offices. All legal consultations and case reviews are provided by our experienced attorney 100% free of charge.